Dutch Ker 46, Van Uden, skippered by Gerd-Jan Poortman, is the winner of the 2017 North Sea Race, having won both IRC and ORC overall, ker 46 sister ship Lady Mariposa beat her across the line but slipped to 2nd on IRC. Piet Vroon’s Ker 53 took Line Honours for the 181 nautical mile race, and placed third after time correction. Ker 46, Lady Mariposa, skippered by Daniel Hardy, crossed the line just 30 seconds in front of Van Uden but was second after time correction. Van Uden Skipper Gerd-Jan Poortman has competed in the last four editions of the Volvo Ocean Race. Gerd-Jan was delighted with the result, secured by a young Dutch team, taking part in their first offshore race. 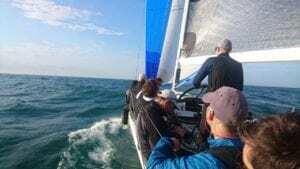 “We have a great new project running, the Royal Maas Yacht Club, Rotterdam wanted a sailing programme for young sailors coming out of dinghies, looking for the connection into keel boat offshore sailing. So we put a plan together with all of the Rotterdam yacht clubs to get a team together to race offshore. The project always starts with the boat and we were happy to have our sponsor, Van Uden, that has been involved in Dutch sailing for more than 12 years. Our Ker 46 was within the budget of the programme and a boat that is relatively easy to sail but hard to sail well, which is exactly what we were looking for. To win the North Sea Race overall is quite hard to understand, to be honest. We have had the boat for three months and sailed together for ten days. This team has an average age of 22, and most of the guys only have experience in Cadets. They are awesome sailors but have no real offshore experience. 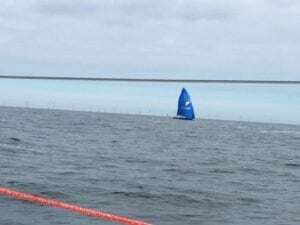 It has been a really good race, we couldn’t see Tonnerre but it was a match race with Lady Mariposa from start to finish, so it was a good competition.